Today we are going to wrap up the final post in the 7 Ways to Pile Up Christmas Money series. If you missed any part of the series, be sure to go back and read through all the ideas. You’re sure to find something to put to use. So far we have talked about ways to find money and ways to stretch that money across your list of giftees. Now let’s talk about stretching your Christmas money by simplifying. Living a simple life is a very popular theme these days. And it’s no wonder, when you think about it. People have so many items and events to keep track of in their daily lives. It’s overwhelming. And the holiday season just intensifies an already busy schedule. You’ll have Christmas parties, school functions, canned food drives, concerts, family traditions, and more. Many of these are worthy and important things to keep up with. But that doesn’t make them less stressful. So how can you simplify? It’s time to sit down and create a list of the most important parts of the Christmas season for you and your loved ones. What events and items are musts for you to enjoy the season? Once you have written down your list of absolute musts, look back over it again. Are any of those musts causing you stress just to think about them? Consider why these things are stressful to you. Sometimes a tradition just isn’t a good fit for your family anymore. Remove what you can from your schedule. Perhaps an event is a lot of fun for your family, but it costs a lot of money. Is there a way to continue the tradition without the expense? Look for discounted tickets or a similar event that is more affordable. Often you can find cheap or free entertainment at local churches. Festivals, live nativities, and concerts are frugal fun. Are cards important to your family? Many people these days are happy to receive an ecard in their inbox rather than their mailbox. If you prefer a physical card, be sure to shop the sales and get your cards made early in the season. That way you can take advantage of the best prices. Be sure to hand deliver cards to friends and family as you see them to save on postage. If you love making cookies, keep a sharp eye out for sales. This is the time of year when butter, flour, and many baked goods will be at the lowest prices of the year. And if you can use the cookies as gifts for some of the people on your list, you can double up on the fun (and the to do list!). Here’s a list of 9 Christmas Cookie & Candy Recipes You Will Love. The holiday season is particularly busy for many shelters. Before you shop the stores, check your closets for unneeded coats and clothing. (Be sure it still has plenty of wear left!). If you clean up the pantry and find 20 cans of perfectly good beans in the back, donate those. That saves you from buying for the food drive. Whatever savings you can find here is money you can apply to your Christmas present fund. I have a bad tendency to think that a child needs “just one more gift” to round out their Christmas. But what I’ve discovered is that far more often than not, that “one more gift” is never loved or enjoyed. As parents, it’s easy to get tripped up on rules that we force upon ourselves. We think we need to spend equal amounts of Christmas money on each child, or give the exact same number of gifts to each kid. Or (to give ourselves the biggest headache ever) we try to do both at the same time! It becomes a terrible game of catch up that you can’t win. And then it turns out that the kids don’t notice any of those things anyway. Honestly. Ask your 5 year old how much a Barbie doll costs. She’ll might say “20 cents” or “200 dollars”. She has no clue. After years of beating my head against the wall, I finally realized that every child is different. They each have their own sets of wants and needs. One child might receive a larger present this year, while the rest get several smaller items. In the end, it will work itself out. If your kids usually get a big pile of gifts, don’t spring the idea of simplifying on Christmas morning. Begin early in the season to practice an attitude of gratitude. Focus on what your recipient would really enjoy receiving. Don’t worry about spending as much money as you can on each person. When you try to impress the other person with cost, you miss the chance to have a meaningful connection. My brother enjoys cooking. I could buy him an expensive skillet set. Or I could pick up a cast iron skillet at Goodwill and reseason it for him. I know he enjoys cooking in cast iron. So while I might not spend as much, he will still like the gift and know that I was thinking of him. 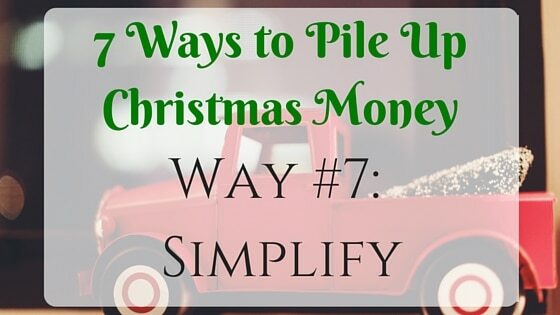 That wraps up the 7 Ways to Pile Up Christmas Money Series! I really enjoyed writing this series! I hope you have found it helpful. If you feel that I missed an important way to find money for Christmas presents, be sure you let us all know about it in the comment section. I love learning from other frugalistas! Have a great holiday season. For more money saving tips, be sure to check out the 5 Ways We’ve Saved Money This Week series. I add to this series every Friday, but you can read through the archives here. Great article! I really enjoyed it . . . Great to connect with your Blog Jamie! We got a very simple way to redecorate our home. We don’t do that much to be sincere. Not having kids and having a cat doesn’t motivate us much. But I can’t wait to see all the shopping done. Thank you so much for sharing these really useful tips on #tiptuesday! Have a fabulous week, Jamie! As November begins we will be budgeting for Christmas, thanks for the great tips! I have already started to think about Christmas. I do a lot of baking for gifts which saves me some money and my family loves it. Thanks for all the great tips. Thanks for sharing at this week’s Blog Hop! I think baked goods are a great idea as a gift! Thanks for hosting the hop. What a wonderful post, I’ve pinned it! I’ve tried to apply many of these ideas to all my holidays: Christmas and birthdays being the big ones. It’s hard, but so worth it. Thanks for sharing on the Homestead Blog Hop, I always enjoy when I get to read your posts! Such great and helpful tips. Oh how quickly things can get out of control especially during the holiday seasons when you aren’t thinking ahead like this. Very useful tips, thanks for sharing with Hearth and soul blog hop. Happy new year to you and your family. These are great tips! I love cookie exchange idea. We do that at work & I love tasting new cookies. I like the mixes, because everyone is so inundated with food around Christmas. It’s nice to save it for a week or two and make it later.